Little M turned six months old earlier this week. I know I probably say it all the time, but where did that time go?! It feels like only five minutes since she was born, whilst simultaneously feeling like she’s been in our lives forever. I’ve been exclusively expressing since that week from hell, and I’m very proud to say that Little M has been exclusively breast fed for six whole months. Excuse me while I pat myself on the back. But I wonder if the time has come to stop expressing. People are always telling me how amazing I am for expressing all of LIttle M’s feeds. But the fact is, I haven’t really felt like I’ve had much of a choice. I do not judge parents who choose to formula feed their babies, at all. In fact, I see it as a perfectly sensible feeding option. Especially if breastfeeding just hasn’t worked out for them, just like it hasn’t worked out for me. But I have this crazy, irrational fear over feeding Little M formula. I know it makes zero sense. Formula is perfectly safe (provided that it’s made correctly to the manufacturer’s instructions). I think it’s that bit in brackets that plays on my mind. I’m worried that I might do something to make Little M unwell. Or formula just may not agree with her little digestive system. She’s been doing so well on breast milk, it seems selfish to stop feeding it to her. However, expressing is a massive faff. It really is. Not so much the expressing itself, more the calculation of time. Thinking about when I need to pump so that I can do x, before coming home to pump again before doing y. Or pumping in the car. Or a toilet. Or my friend’s spare room. It would be so much easier to just stop expressing. I think getting up at 4:30am for BlogFest when I didn’t need to leave the house until gone six was the reality check. That added to the realisation that I just wasn’t getting myself and Little M out of the house enough because it was easier just to stay in and do nothing. But now that Little M is six months that’s not really good enough. I’m failing her in a different way as a parent. So last week I took the decision to get over my fears and reduce the amount of times in a day that I express, with the idea that gradually my milk would dry up and I’d be ‘forced’ to feed Little M formula. Now, instead of expressing 5-6 times per day (every 3-4 hours), I wait at least five hours between pumps and express 4 times per day. Great plan! Except my ‘yield’ hasn’t really gone down. I’ve cut my pumping time from 20 minutes to 18 (on advice from the Kellymom website) to see if that would have an impact, but it hasn’t (yet). Then I looked at the price of formula. Gee whizz it’s expensive!! So now I have an economic reason to keep pumping. I’m not sure we can afford to fork out all that every month, especially having spent a small fortune on a breast pump. Although I’m also not sure how much of it we’d actually use now that Little M is about to start weaning. Ugh, I hate the unknown! So I kind of feel back at square one again. I’ve got another blogging event to travel to in a couple of weeks time and it would be really nice to not need to pump at all, but looking at the time it starts and the distance from home, I’m going to need to have to pump in the car again I think. And not at a convenient time, either. Pants. 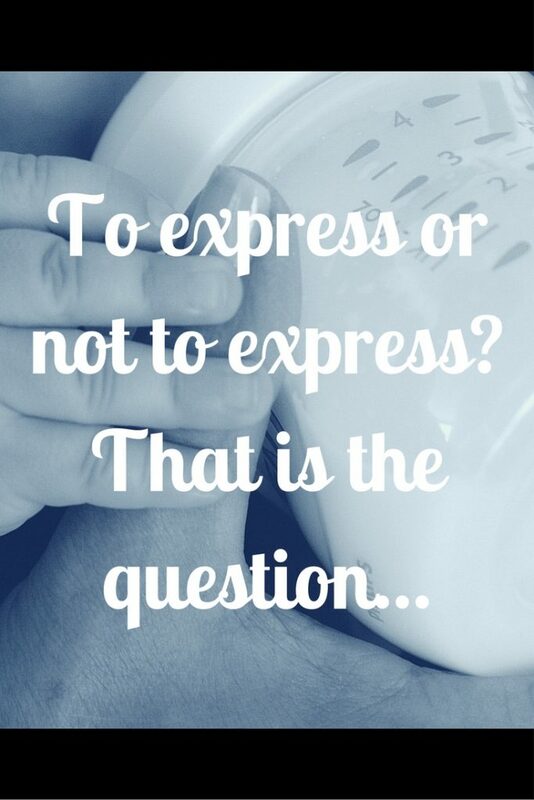 I know lots of women stop breastfeeding at six months, so why am I finding it so hard to stop expressing? I’d love to hear of your experiences of a smooth transition from breast milk to formula. It might help with this guilty-gut feeling I’ve got going on inside! "Tripp Trapp Moments – Getting Ready to Wean"
"Make Sterilising Easier: Nimble Babies Review and Giveaway"
Crazy how they grow so quickly, but yet our life without them seems such a far distance. I feel you about the faff of expressing. I did it for almost 6 months to increase and support my supply. Massive kudos for doing it exclusively. Might you consider letting your little one latch on to see if this might work for both of you? Breastfeeding definitely keeps food costs down; I don’t like thinking of how much we spent in the few months that we combi-fed with Formula – definitely an expense I was pleased to do away with. No advice about transitioning, but wishing you all the best as you decide the best way forward for your family. Are you part of the exclusive pumping group on Facebook? I wonder you might get more experience reads from there. I know they can take cow’s milk from 1 years old and that’s much cheaper, but you’ve 6 months to get to that point. All the best as you decide. My body has never been able to successfully breast feed. And every time it fails me, it’s like a stab to the heart. Doesn’t matter what I do after those first few days of having boulders stuck to the front of me, it just dries up. Even when baby is trying to feed. So I have done it both times for as long as possible, feeding and expressing and only managed 8 weeks. So i think that 6 months is freaking amazing!! I exclusively breastfed my eldest until he was two years old! It was tough and I have no idea how I got through it but working from home was a definite plus. With my second child however, I had to stop expressing before she turned 1. The transition wasn’t easy because she refused to drink from the bottle! It took about two weeks of having to toughen up against her cries but she finally relented. We’re so lucky that Little M has been so good at taking to the bottle. I’m still expressing now at nearly seven months. I’m not sure what I’ll do when the prospect of returning to work looms!